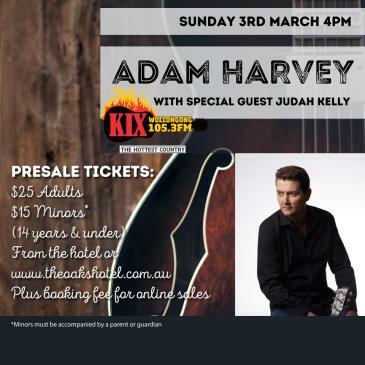 Coming to The Oaks in March2019 is Australian country music’s premier artist, Adam Harvey, with special guest Judah Kelly. For celebrated entertainer and country music purist Adam, one musical era stands out head,hat and shoulders above all the rest: Nashville’s seminal 1970s Golden Age.Fulfilling a lifelong dream, Adam jetted off to the bright lights of the immortal Music City to record masterful 10th studio album The Nashville Tapes, armed with a brace of new songs couched in the classic country sounds that most capture his imagination. With eight Golden Guitars under his belt, Adam ranks among Australian country music’s most decorated artists. Add to that more than half a million album sales, back-to-back No.1 albums on the ARIA Country Albums Chart, three ARIA nominations, and a succession of Gold- and- Platinum-certified albums, and it’s easy to see that Adam’s trophy room sparkles from every angle. In making The Nashville Tapes, Adam decamped to Nashville, Tennessee,where he and another longtime mate, producer Nash Chambers, assembled a crack team of Music City’s finest and most sought-after session players to assist in realising the album. The Nashville Tapes is yet another career-best album for Adam Harvey. A deeply personal, powerfully reverent release not years but decades in the making, The Nashville Tapes is the master work of an all-time Australian country music legend. Please note: Limited seating is available for general admission tickets, so book a table early. Minors must be accompanied by a parent or guardian.